The AMS 358i is used wherever position data of moving system components, such as e.g. in high-bay warehouses are calculated. A unique selection of industrial Ethernet, supplemented with all well-known fieldbus interfaces, makes the AMS 358i a “global player”. Distances of up to 300 m are calculated by the use of the most modern signal processors with maximum accuracy in the ms grid. Borderline situations can be detected and indicated with the integrated, extensive functionality catalog. 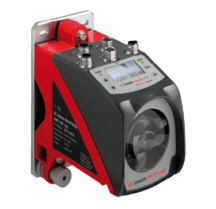 Purchase your Leuze AMS 358i Laser Distance Measurement Device today!